If your business has tractor-trailers and needs capital, it can get a loan against tractor trailer or a loan against a semi truck. 1 tractor-trailer trucks can be enough to get capital. Loan amounts normally start at $10,000 and up. There are several loan programs and resources available in the marketplace to get semi-trailer truck financing. Credit scores can be lower under this program. Credit scores of the owner can be below 500 and still have a strong opportunity to qualify. The truck or semi-truck has to be free and clear. There cannot be any loans against the truck. Complete the secure Docusign SBLD30SecondApplication”>Question? How to get a semi truck loan or how to get a loan for a semi trailer or loan against a semi truck. Join thousands of businesses who have gotten a business loan against a tractor trailer or semi truck. 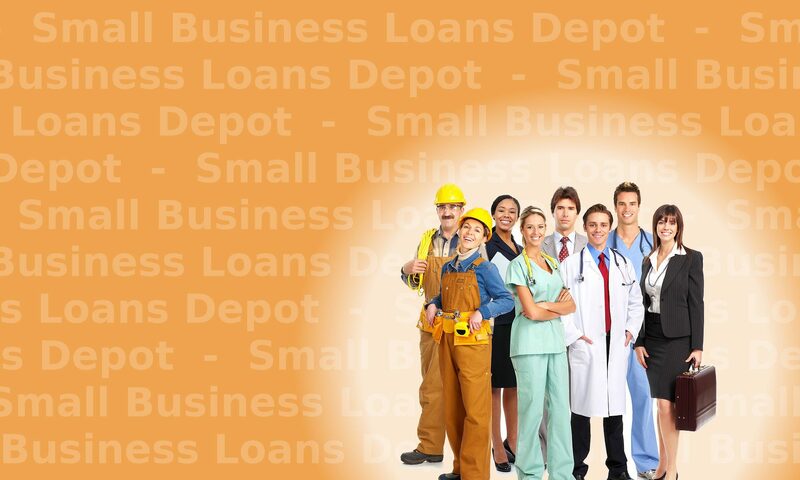 Together, you will get you the best program for your business with Smallbusinessloansdepot, the first choice for a tractor trailer or semi truck business loan. mid 500’s. He wanted to get funds against his Semi-Truck. The truck has a value of approximately $25,000 and he still owed about $16,000 on it. 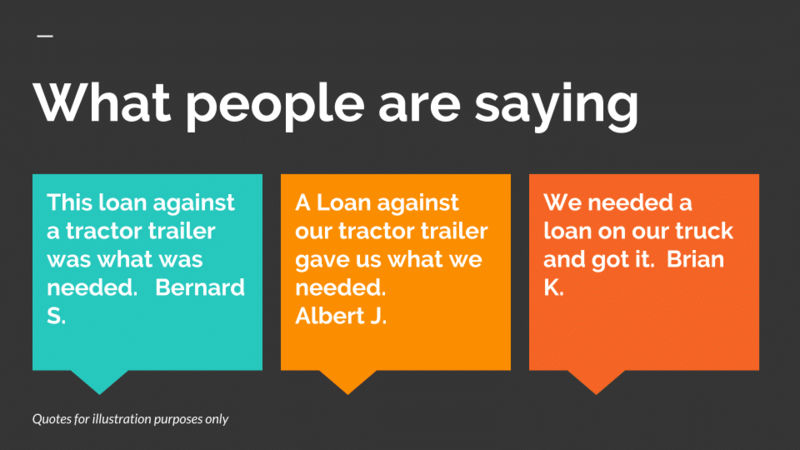 A loan against the truck is not possible in his case. The truck has to be free and clear. We referred him to another loan product which has a monthly payment. A company should make up a list and provide it to the lender to get a loan against 18-wheelers. The trucks normally have to be free and clear. The terms the customer can get are usually attractive because they are not short term and the collateral is valuable, so the lenders will give more attractive rates. A one page application is completed along with an equipment list. The customer normally can get a decision within one or two days. 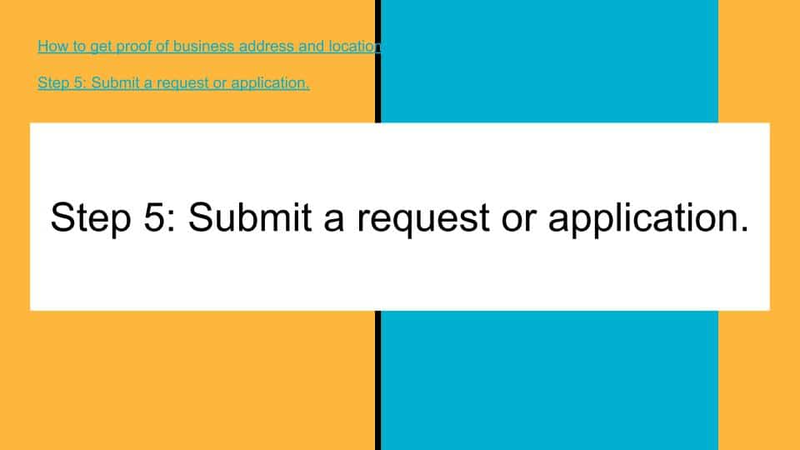 This type of business loan is closed within 1 or 2 weeks. Click on the contact link to get more information. Loan amounts are based on roughly 2 to 1 collateral and on the wholesale value. If a business has 2 semi-trucks and they are worth $100,000, the loan amount will probably be in the $40,000 to $50,000 range. For customers in Canada, this financing is available and should be inquired on under a related program. Canadian callers should ask for a “loan against a transport truck” or loan using a transport truck. Online resources include an interest calculator. Customers can type in the loan amount, the number of months and the monthly payment to find out the interest rate. As an example, on a loan for $100,000 for 60 months with a payment of $2,163, the interest rate calculates to 10.77% with a total repay of $129,780. Rates may be higher in most cases because the credits scores may be lower. No other collateral is required. If a company obtains this loan, a site inspection is normally done by the lender. This may or may not have to be paid by the customer depending on the program. Tips: The trucks have to be accessible and in working order. A UCC filing is placed with the department of motor vehicles in the state the business resides in. 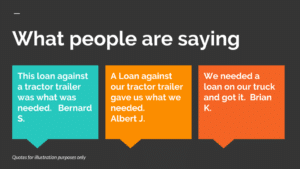 Thank your for visiting our loan against tractor trailer page. Because the success of your business is our goal.